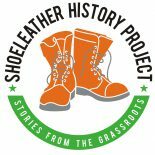 Waterbury, Connecticut is a company town, but in 2013 union members and neighborhood activists won their two-year battle to change that. The “Brass City” is not the industrial fortress it once was, where the Scovill, Chase and Anaconda companies hired thousands of local metal workers and controlled the political and economic life of the city. Today, the city’s largest private employer is the healthcare industry: Waterbury Hospital and St. Mary’s Hospital, which together employ almost 3,000 people. The two venerable institutions, each over 100 years old, hold sway with the local and state politicians who dress up every year to attend gala fundraisers and pledge their fealty. There’s nothing the Mayor and Aldermen won’t do to keep the hospitals happy, but, like all the brass factories that closed or have left the city since the 1970s, a recent attempted hospital takeover renewed the anger and anxiety many Waterbury residents recall from the era of runaway industrial shops. 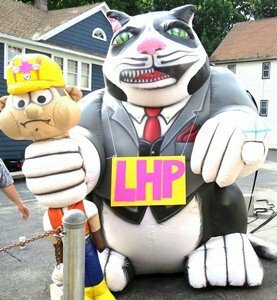 When it was announced that the Texas-based private equity firm LHP was ready to purchase and merge the two non-profit Waterbury facilities into one big for-profit, state-of-the-art hospital, every power broker and opinion-maker in town lined up behind the scheme, no questions asked. The so-called merger (actually a buyout) promised more jobs, better healthcare, increased revenue for the city, and a revitalized downtown. It was essentially a done deal, a steamroller that could not be stopped. And why would anyone want to stop such a dream project? Both hospitals have suffered financially over the last few decades and have tried but failed to merge their operations a number of times. Their money problems stem from two primary causes. First, both facilities provide care to thousands of poor and working people who have no health insurance. The emergency rooms at the two hospitals have become the source of primary care for a population of 110,000 people in a city with 13 percent unemployment. Second, the Catholic Church-run St. Mary’s has a $65 million pension debt — that is, the hospital owes millions to the retirement program it created for employees and could not make payments into the fund. Their pension fund, with a 59 percent unfunded liability, rates the worst in the nation for non-profit hospitals, according to a recent Moody’s investors report. This pension albatross was the first bill LHP promised to pay, a generous offer on which it would never make good. 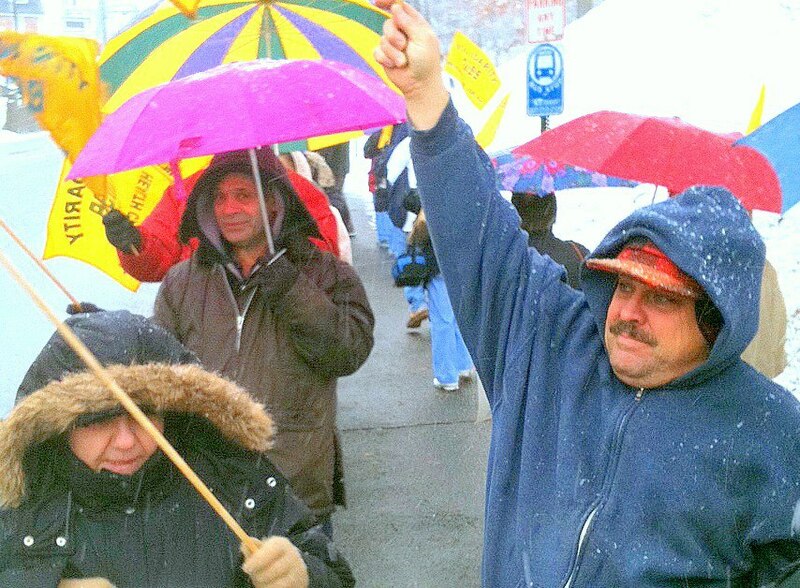 In spite of the odds, District 1199 New England/SEIU took on the merger issue. 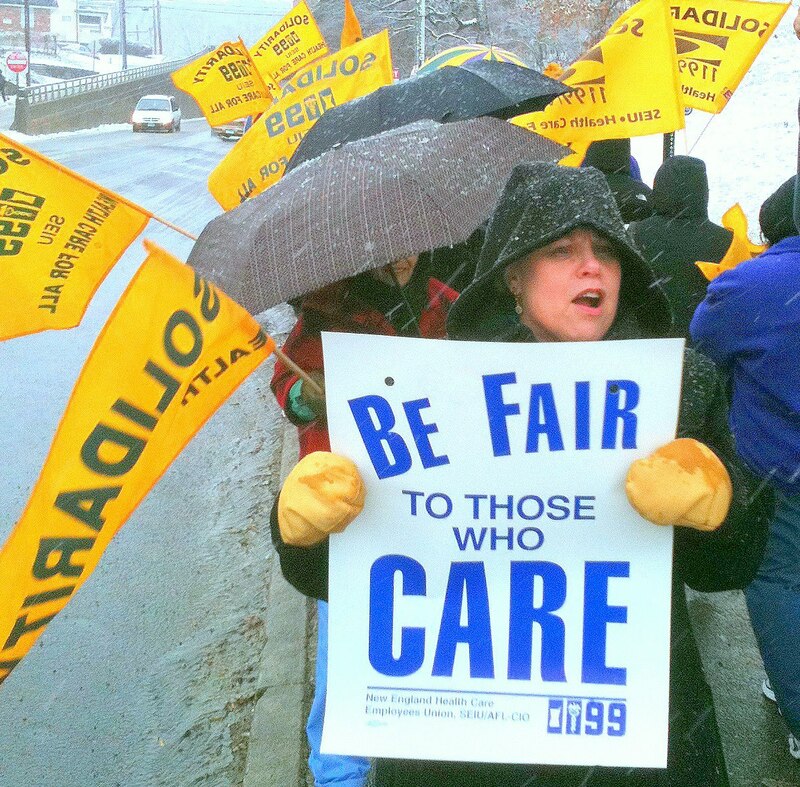 The 27,000-member healthcare union—composed in Waterbury of patient care associates (PCAs), dietary, housekeeping, laundry and maintenance workers—questioned the basic corporate assumptions that had dazzled local hospital administrators and politicians. There would be a shiny new hospital in place of two outdated facilities, yes, but what about the existing workforce, their union contract, and the benefit gains they had fought for and won over the past three decades? 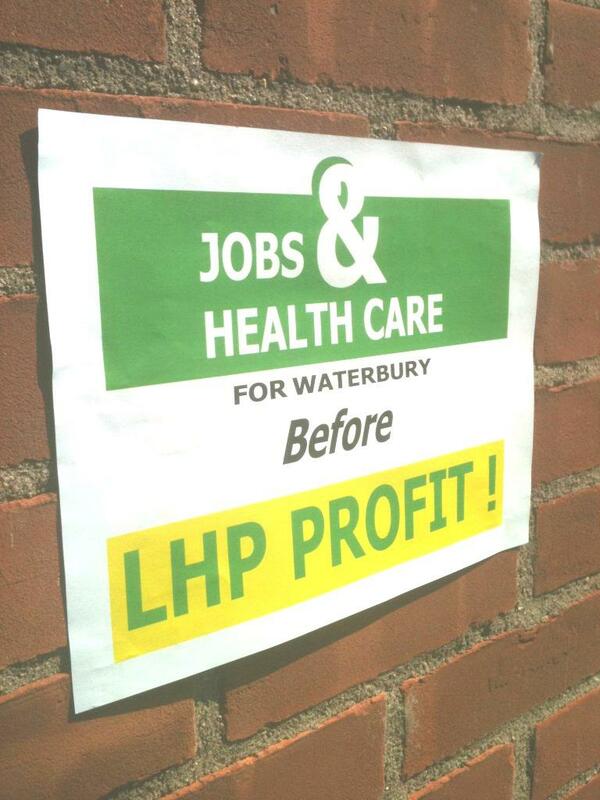 Neither LHP nor Waterbury Hospital had any practical or strategic interest in maintaining a unionized workforce. And what about maintaining the current level of health services and accountability to the community? Corporate decision-making, not to mention profits, would soon flow out of the city and down to LHP’s home base of Plano, Texas. Future decisions about providing medical services would be determined by profitability. These issues concerned both the neighborhood groups and District 1199 workers, most of whom were city residents as well. The union was facing a major challenge at the same time LHP appeared. It had to negotiate new contracts for 450 workers to replace the two agreements set to expire in February, 2012. Those contracts needed to include a successorship clause, a guarantee that when Waterbury Hospital was sold, the new owner would be required to keep the workers and their collective bargaining agreements. Healthcare workers also faced a new hospital CEO, Darlene Stromstad, a labor relations novice who was dismissive of unions and determined to force significant benefit givebacks. According to District 1199 president David Pickus, the union’s strategy was to target LHP as the sole decision maker for all the problems facing the workers. Together with longtime local activists, the union initiated a labor/community coalition known as Community United for Jobs, Healthcare and Opportunity (sometimes called “Cujo”). It held its first city-wide forum in December, 2011 with the co-chairs of the state legislature’s Public Health committee as guests and a host of neighborhood leaders in attendance. 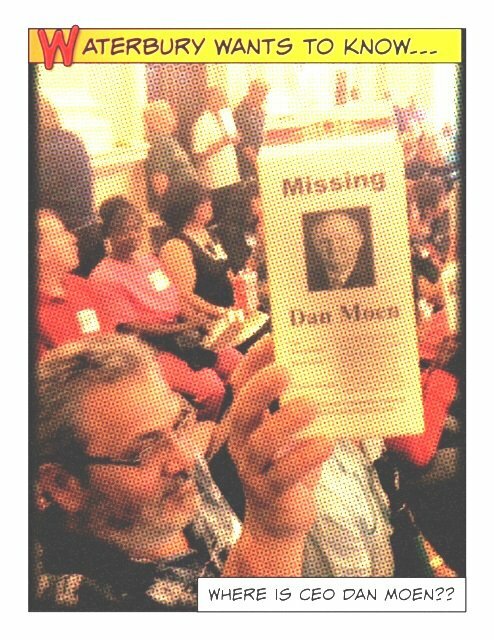 The packed house of workers and neighbors publicly raised, for the first time, the community’s unanswered questions. It proved to be a successful kick-off for a year-long campaign. As Reverend Leroy Perry, pastor of the AME Zion Baptist Church put it, “I have been told all my life, when something looks too good to be true, you better take a look at it more carefully. The hospital venture will be 80 percent owned by the LHP private equity firm,” he said, “so who will be in control? Community United also took their fight to the Board of Aldermen. 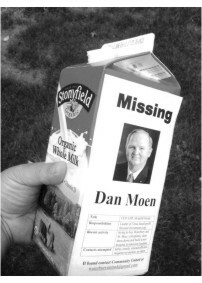 The 14-member governing body was not directly a player in the hospital takeover—since hospital merger approval is granted by the Connecticut Attorney General and the state’s Office of Health Care Access (OHCA)—but the Board functioned as LHP’s number one cheerleader and was key to creating friendly zoning regulations. The Aldermen were an easy target—they met twice a month and provided an open comment section on their agenda. Community United turned that public space into a mini-rally each time they attended. 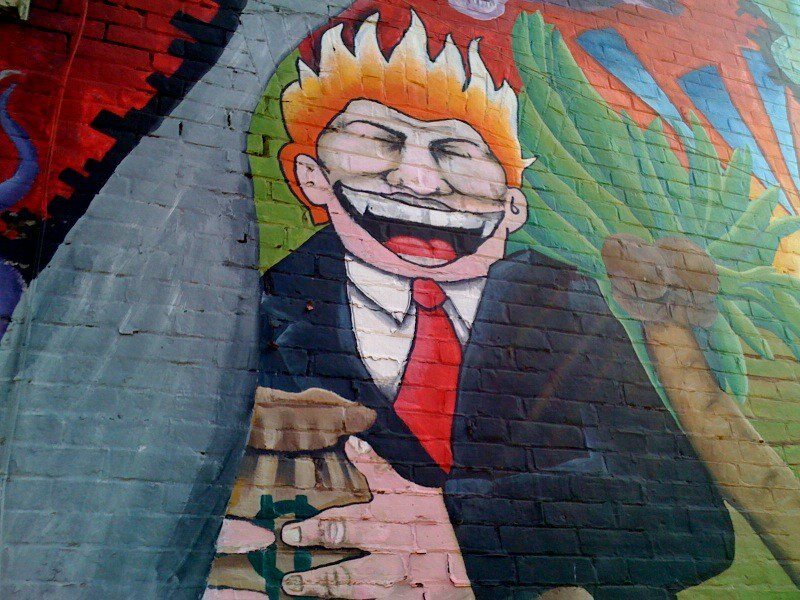 The coalition issued a simple, and reasonable, challenge: as the elected body in charge of the public good, the Aldermen should put LHP face-to-face with the community. The coalition canvassed over a dozen distinct Waterbury neighborhoods and spoke with hundreds of families about the takeover. Support for Community United’s position was overwhelming: they collected more than 1,000 pledges of support which increased the new group’s credibility, specifically committed residents to supporting union jobs and benefits, and built the mailing list. Organizers knew their efforts were working when they discovered hospital administrators trying to do the same neighborhood outreach, with minimal results. The takeover advocates tried to portray their plan as a “coalition of equals,” insisting that the hospitals would appoint two-thirds of the proposed board of directors. Opponents didn’t buy it. “Wall Street is running this operation,” said Liz Brown, a school board member and veteran political activist whose special concern was the future availability of reproductive health services. It was the Catholic Church that unwittingly played a key role in the demise of the takeover plan. Opposition forces had a mighty ally in Teresa Younger, the progressive and energetic executive director of the state’s Permanent Commission on the Status of Women. Younger brought with her the nationwide advocacy group MergerWatch, created to protect women’s health services when religious and secular hospitals merge, and Compassion and Choices, which monitors end-of-life and palliative care options. Reproductive services and the right of patients to control their own deaths are forbidden by the directives of the U.S. Conference of Catholic Bishops. “We want this deal to work,” said Community United’s Liz Brown, “but it can’t be at the expense of women.” No “second-class citizens” here, Brown proclaimed. “Separate is not equal,” added Teresa Younger, who is African American. Although religious and secular hospitals have successfully merged previously with the blessing of the Vatican, Connecticut Archbishop Henry Mansell made it quite clear that as long as St. Mary’s was in the mix, the new hospital would not provide abortions or any sort of reproductive care (including vasectomies). This put him squarely at odds with Younger and the state’s women’s groups, and in particular Governor Dannel Malloy and Lieutenant Governor Nancy Wyman, both of whom are pro-choice. Despite attempts to compromise, the LHP project was stymied by this community roadblock. Seventy-six times in 2011, women patients at Waterbury Hospital had received tubal ligations after caesarian births. If LHP and Archbishop Mansell had their way, the patients would have been shipped to a separate facility to get their tubes tied before they had recovered from labor. This was a dangerous and unnecessary risk to women, Younger and Community United insisted. State regulators were in no hurry to confirm the venture as long as the controversies went unresolved. On October 13, 2012, Waterbury Hospital called off the merger, citing their inability to win approval for the scheme, and blaming the union for delaying the needed state regulatory approvals. In March 2013, after a credible strike vote and a number of militant actions inside the hospital, union workers won their first ever successorship protection. And just in time: the LHP corpse was barely cold when Waterbury Hospital announced a new buyout, this time with Vanguard Health Systems and without St. Mary’s Hospital. Vanguard is now set to be acquired for $1.8 billion by the giant Tenet Healthcare. Says Steve Schrag: “We have the same questions for Vanguard that we had for LHP. When will you meet with us? How will good jobs and healthcare be protected in our city?” Schrag and his cohorts say they intend to press the state legislature to require a community benefits agreement each time a for-profit hospital tries to move into the state. 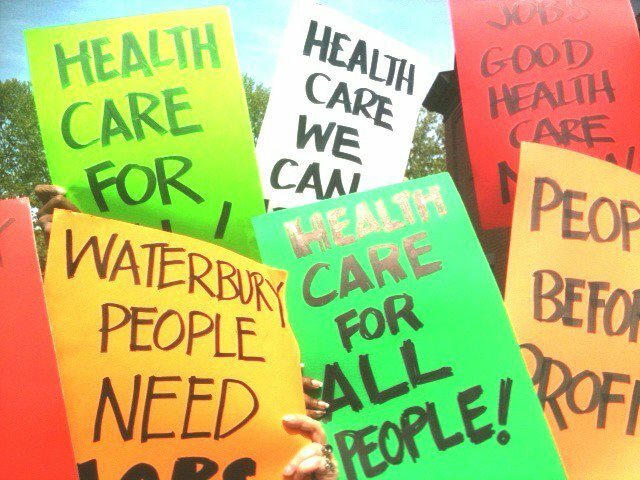 Community United’s victory over the “Texas millionaires” will provide a template for this next campaign as the Waterbury activists continue to hammer away at the company town’s dominance over jobs and healthcare. This entry was posted on July 25, 2016 by Steve Thornton in Hartford.